Discussion in 'Streetwear and Denim' started by Spirit of 69, Nov 19, 2008. Interesting haircut on the left, looks a bit shorter on the top? Reminds me a little of the young Billy Walker (boxer-entrepreneur-club owner). Found a pair of vintage, genuine "bowling alley" bowling shoes for sale. These are exactly the same as the ones that were rented at the Airport Bowl in Heathrow in the 70s/early 80s. I myself had a pair in 1982 when I 'forgot' to exchange them back for my actual shoes at the end of the bowling session. I painted over the blue stripe and heel with black Lady Esquire shoe dye on the pair I liberated, to make them less clownish-looking/stolen. Impressed at the state of those! All the bowling alleys around in my youth seemed to be stocked with used or factory-reject shoes. Looks like my 70s hair! Could be Brylcreem, that stuff was always knocking around back then. Actually, not sure, was just on a skinhead blog. Bermondsey, London ‘69 supposedly. What was the drinking age back then they look like children and judging from the mugs are "legal"
@Inkss any intention on resoling them for more outdoor use? Cant remember the exact age catchourbreath - I'm thinking 18 was the legal age, but that no questions were asked once you were about 16, unless you looked ridiculously young. I was in the pub regular at the weekend from age 15. It was eighteen. 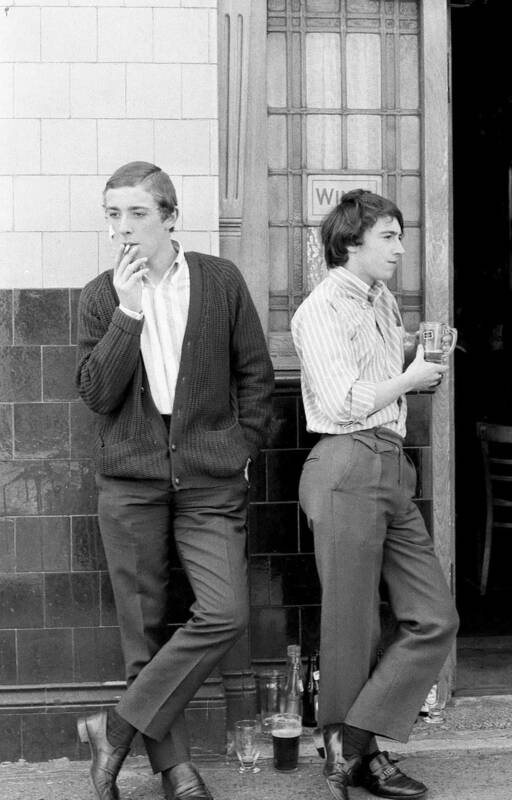 The pub a five minute walk from the Savoy Rooms in Catford wouldn't serve anyone who looked like they had come from the Savoy, because most of the kids there were under 18. I was eighteen and I remember bitching about it, so they served me. My girlfriend at the time was sixteen, so I guess the laugh was on them. I'd be interested what was used to keep 'collegeboy' cuts in place. Pomade? Probably too strong. I've got something called Lucky Tiger Cru Butch for periods when I wear my crop a tad longer & with a hint of a parting. I never put anything on my barnet. I didn't know anyone who put anything in their hair, but there was something called Vitalis used by some ,with longer hair, like our friend from Bermondsey on the left. I believe it was a non-greasy iliquid that dried to a no shine finish. Brylcreem was by then an old mans hair dressing. We used Butch Wax for flat tops and other hair management. I can still smell it. Good memories.